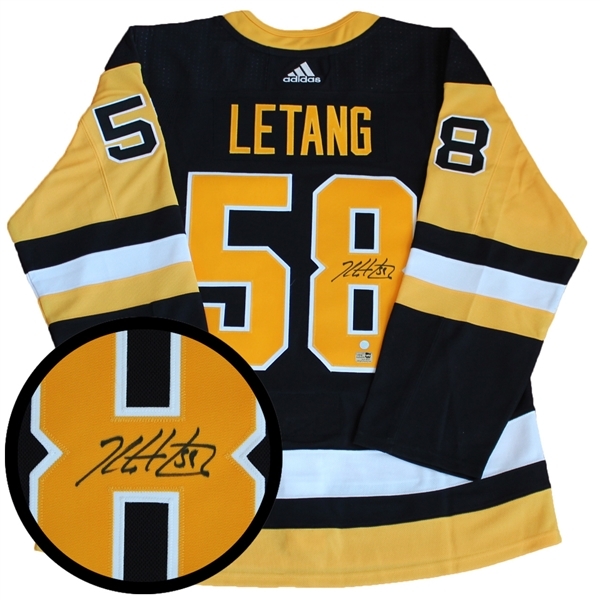 This jersey has been personally signed by Penguins defensemen, Kris Letang. Letang is a great two-way defender that plays strong as a defensemen and produces a lot of offense. Letang was drafted in 2005 in the third round by Pittsburgh. Although struggling with some injuries in his time in Pittsburgh, Letang will always dominate while healthy and on the ice. After the 2018 season with Pittsburgh, Letang has accumulated 437 points in 682 games. Letang has been a key role in Pittsburgh's three Stanley Cup wins since 2009. Letang was selected to the NHL All-Star game four times and was named to the second All-Star team in 2013 and 2016. Kris Letang is set to make his 5th All-Star appearance in 2019. A Frameworth hologram and certificate of authenticity are included to ensure the legitimacy of the signature. Frameworth is an official licensee of the NHL & NHLPA. We do not guarantee any specific jersey sizes but we typically carry sizes L, XL or 52, 54 & 56 for Pro jerseys. These sizes are considered the most ideal for framing & displaying.